The Immanuel church family strives to provide faith-building activities for children from a very early age, beginning with children on the cradle roll. Sunday School is offered for children ages three to twelve. Upon reaching the age of twelve, children are instructed in the particulars of the Lutheran faith by attending Confirmation classes. Leaders and volunteers seek to provide programs and events for the tweens and teens of the community and the congregation through a youth group. A women's ministry offers spiritual nourishment to members and friends of the congregation. This ministry has provided several workshops which included dynamic guest speakers, fellowship, and food for body and soul. Several times throughout the year a family night event is held which includes a covered dish supper, a film, a topic-centered discussion, or another activity. Children and teenagers are welcome, and special activities are prepared for them. During the summer, Vacation Bible School (or similar event) for children is offered. It is usually held in the middle of July and is open to children of all backgrounds. Children from the neighborhood are welcomed along with the children from the Immanuel church family. 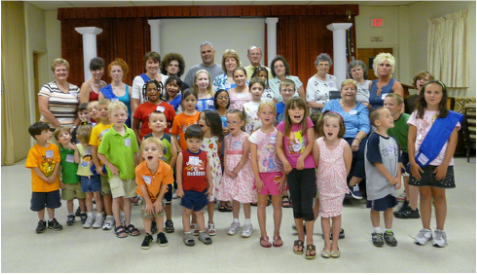 Vacation Bible School includes a variety of fun and learning activities, such as singing, playing, crafts, prayer, dance, learning, and (yes) snacking.